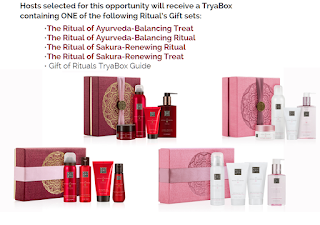 Free Rituals Shower Products Gift Set Tryazon Party Pack If You Qualify. Everybody chosen will get a Rituals Gift Set with 4 Full size Products inside - Containing Shower Getl, Body Scrub, Body Cream and Hand Soap. There are 400 spots available for this party from Tryazon. This is a new website similar to House Party and not many people know about it, so great chance to get picked. We always have lots of people chosen each time so sign up below!! Click here for their FAQ.